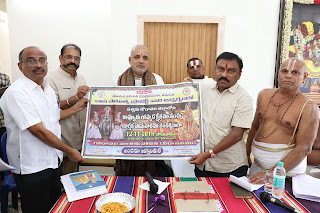 Tiruchanoor, 8 November 2018: The Dasa Sahitya Project of TTD will be observing Godavari Harati on December 12 on the banks of River Godavari in the sacred Goshpada Kshetram in Kovvuru of Rajamundry. P Bhaskar in Tiruchanoor on Thursday. He said, the religious event will be observed between 5pm and 7pm on that day. Spiritual discourses by eminent scholars have also been organised", he added. The event will be organised under the supervision of Dasa Sahitya Project Special Officer Dr Ananda Teerthacharyulu.